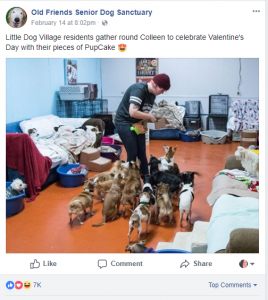 It has been said time and time again: animal shelters know what they’re doing when it comes to social media. Animals and their adorable hijinks are a beloved internet favorite and stir up plenty of emotions. Most nonprofit organizations’ goals are to engage on social media and garner awareness. Engagement does not seem to be a problem for animal welfare organizations; here’s how you can copy what they’re doing to boost your own engagement. What Types of Posts Work? We went through a few of Qgiv’s own animal shelter clients that are social media pros and gathered some examples of what worked for them. Hint: they’re simple AND fun to do! We’d let Lester take us out anytime. People love helping out when animals are involved. 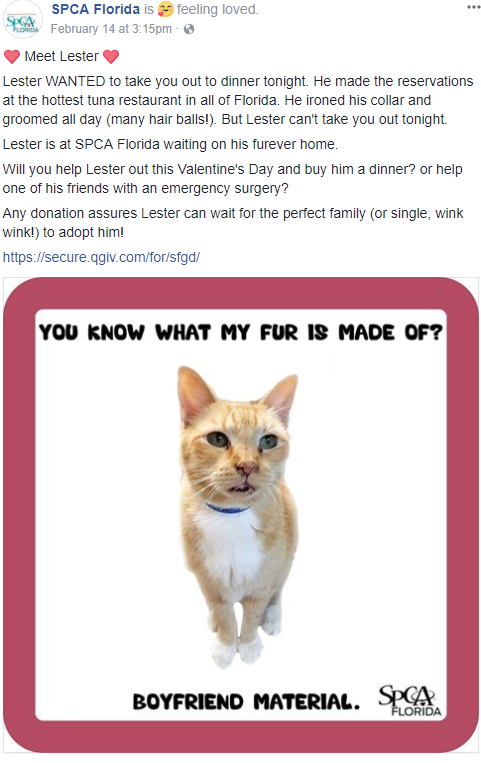 Just look at Lester here: who wouldn’t want to donate to help this cutie? Or, better yet, adopt him! 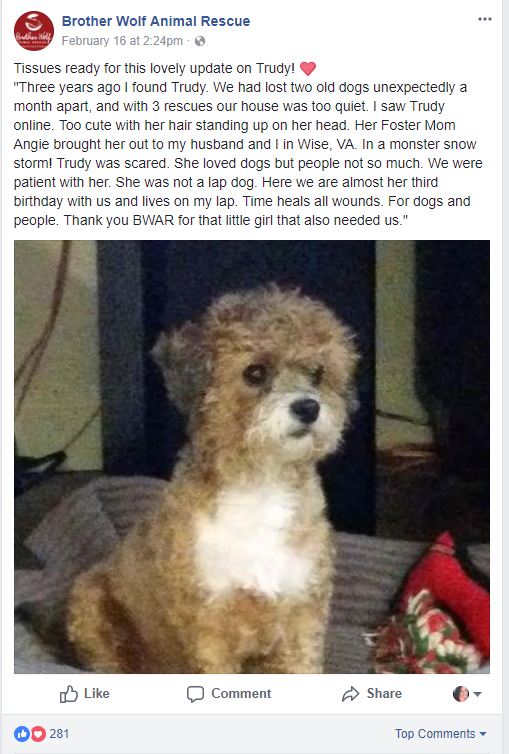 The SPCA made a cute but emotional plea for help on this post. 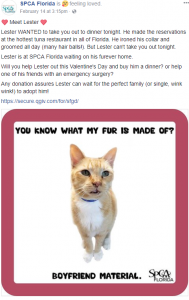 Without their asking, no one would know animals like Lester needs a home or that his friends need emergency surgery. Notice they didn’t come out and bluntly state what they needed. Personalizing a post, making it fun, and telling donors where their funds will go works. Don’t shy away from asking. Your supporters want to help out! 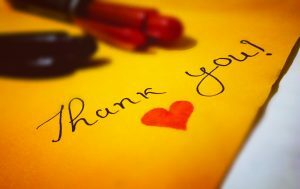 Thank them for their generosity and make sure they always are in the know about what the shelters needs are. Just look at these cuddle bugs! If you follow tons of animal shelters on social media (like we do) you will see the hashtag #adoptdontshop a lot. Following these hashtags are usually stories about the animals in need. A sad story is heart wrenching, but there are so many great outcomes for these animals from supporters’ help. Share these stories! Let your audience know their contribution and love made a REAL difference in these animals’ lives. Abuse and neglect are important (but very tough) topics to talk about. They’re important. But they shouldn’t rule the page, though, as publishing only sad posts will push many people away. It’s difficult to be on a social feed with nothing but sad stories. Focus on the happiness after the sadness. Circumstances can change, just like in Jade’s case above. She has some pretty adorable Valentine’s! 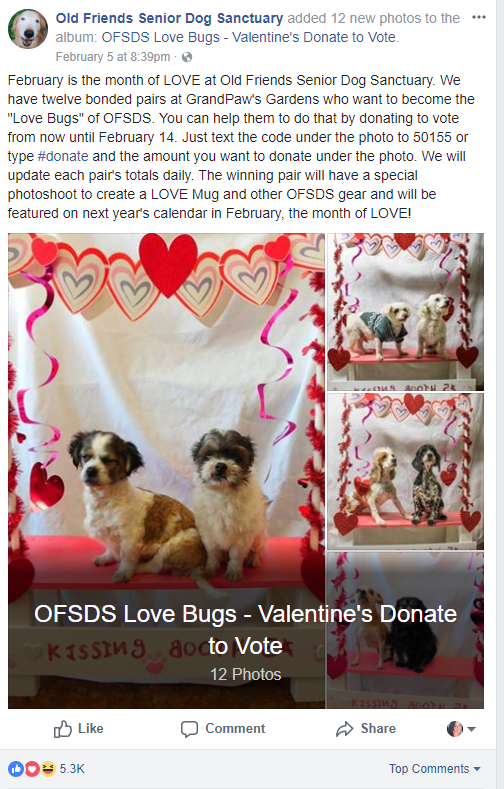 How shareable is this post from Old Friends Senior Dog Sanctuary? Everyone can see the care that the senior pups receive at this center. Being able to show that their center is thriving because of donors’ support makes them want to give even more. Plus, you get to see the condition the dogs experience through these pictures. 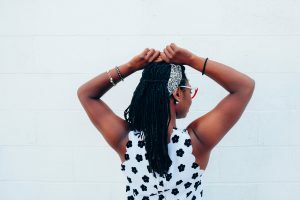 This is a compelling way to resonate and connect with donors. Transparency is honesty and the key to gaining funds. Make the most of these photo opportunities! Adorable pictures of animals are shared often and liked by lots of people. Just look at how many likes their post received! Over 7,000 supporters got to see a glimpse into a day in the life of Old Friends Senior Dog Sanctuary, which is incredible (and adorable). We are very serious about puppy sitting. 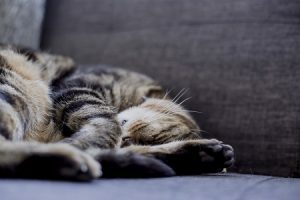 Hosting any type of event is a win for nonprofits, but for animal shelters, it’s a game changer. Posting events on social media is important to get the word out to the community! Ask your supporters to share the event and keep posting pictures and incentives to excite potential guests. 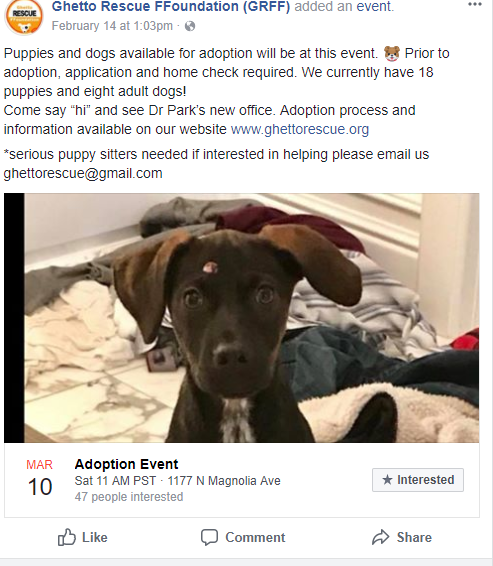 The Ghetto Rescue Foundation’s incentive is pretty enticing — adopt puppies and dogs AND puppy sit? We’re sold. These events invite people not only to see behind the scenes, but to put a face to the organization. A human element is beneficial to creating lifelong relationships with supporters. 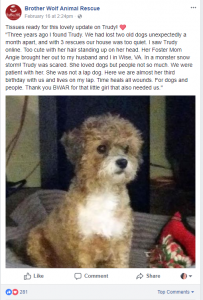 Even if they can’t adopt an animal that day, attendees still have a rewarding experience. Visibility into your organization and spending time with the community that supports your cause will increase funding and donor retention rates. Who wouldn’t want a mug with these love bugs on them?! Ah, gamification. It works! 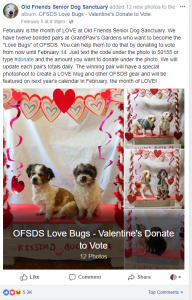 The Old Friends Senior Dog Sanctuary created a cute and very engaging contest for Valentine’s Day. Offering incentives such as swag, mugs, and calendars is a sure-fire way to boost engagement and receive donations. Even better, this was made easier by donating via a simple text message. This creates a fun atmosphere on social media with participants checking back often to see the status of the competition. Supporters know their donation is going to a great cause and they receive a prize, all while having fun! 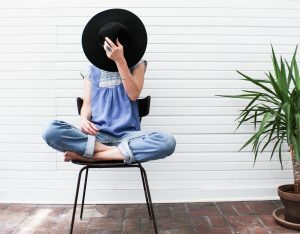 Raise more money by creating a unique donation request that makes giving fun. 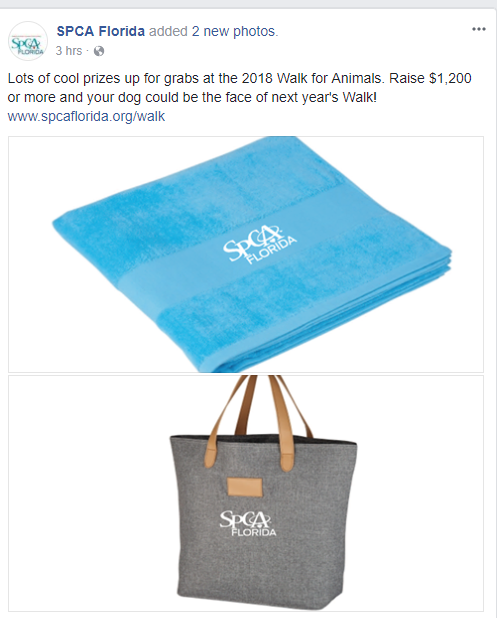 Below is a great example of branded swag the SPCA is offering for their peer-to-peer event this year. In one simple sentence they listed prizes and a set goal for their fundraiser. Keep up the paw-some work! Honestly, we want to see animal posts all day long. Keep them coming! 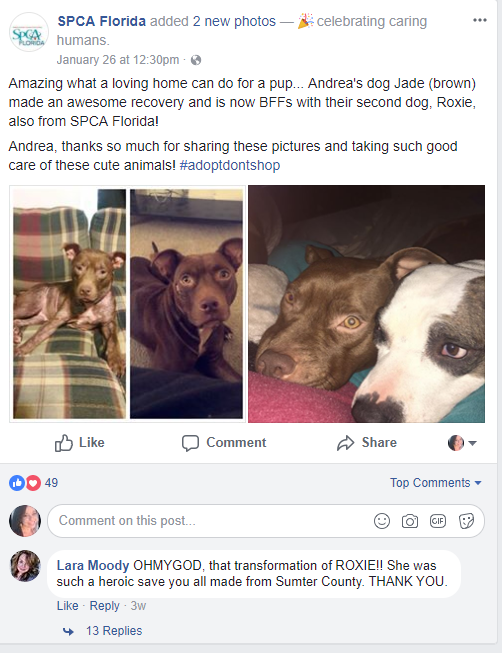 Social media is a great benefit to animal shelters. Let these examples help guide you in the right direction with your posts. Qgiv is lucky to have the opportunity to work with amazing animal shelters and help them succeed in their efforts. Remember — your victories are their victories! A donation or adoption means a happy and safe animal. Portray this on social media and use it to your benefit.